Using a dish towel, paper towel, or fine mesh bag; add grated yam and zucchini in handfuls and squeeze out as much moisture as you can. Place grated yam and zucchini in a bowl and mix with egg, spices, and flour. Using your hand, take a small handful of latke mix and squeeze between your palms to remove all moisture and flatten into a pancake. Drop pancake into oil. I did 2 at a time. Wait for the first side to brown before flipping. Brown the other side and remove onto a paper-lined plate to drain. To poach eggs, get a sauce pan or pot and boil some water. Add the vinegar. Using a slotted spoon, remove the eggs when the whites are cooked through but the yolks are still runny. 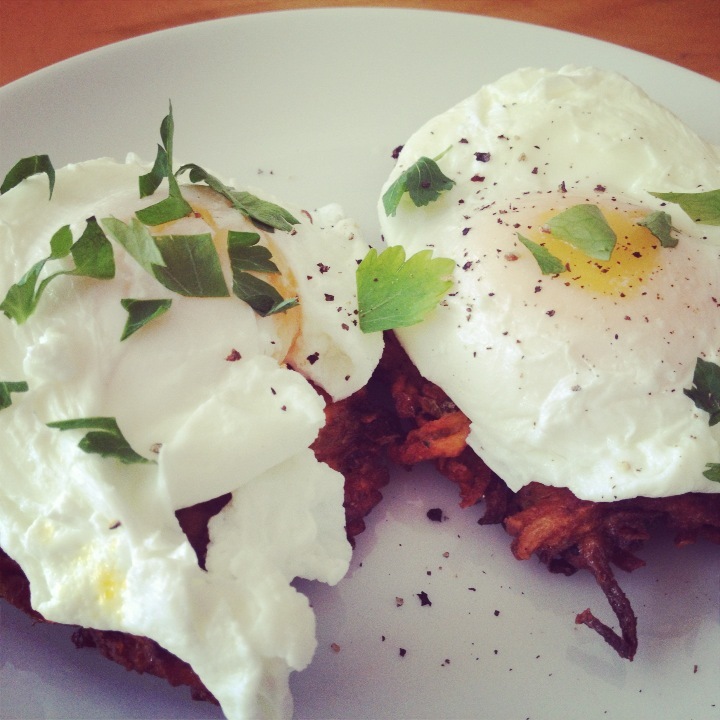 Serve eggs over latkes and garnish with some chopped herbs and freshly ground pepper.